I've been using both the Kiehl's midnight recovery concentrate which is a facial oil, and the Kiehl's powerful-strength line-reducing concentrate, which is a targeted anti-ageing treatment for lines and wrinkles. 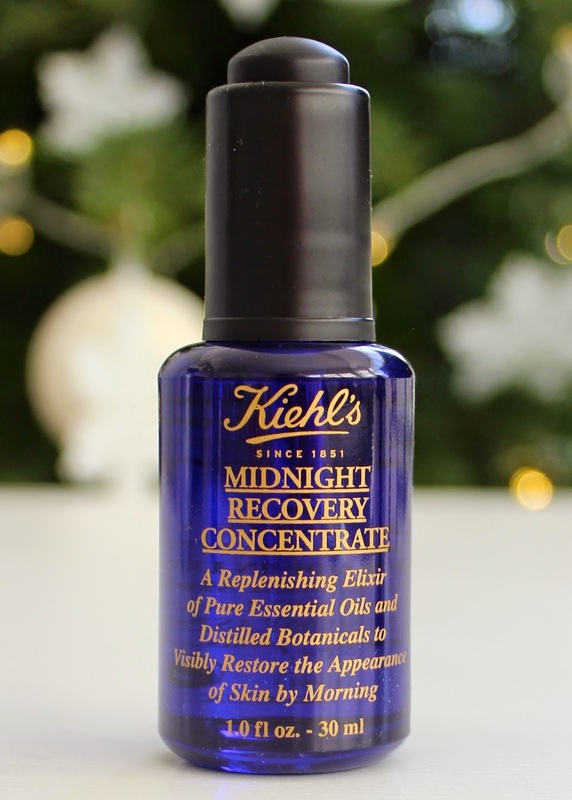 I have to start by saying that the Kiehl's midnight recovery concentrate is a total pleasure to use. I press this into my skin at night as a final step (unless I'm using any sort of overnight mask) and I genuinely enjoy using it. Some nights I really can't be arsed to faff around and just want to get to sleep, so having a product in my routine which I actually want to apply is such a bonus. This elixir (I love that word - it makes me think of magic potions) is packed with almost all natural ingredients including evening primrose oil, lavender, omega-6 fatty acids and squalane (an oil derived from olives). It has a beautiful spa facial type scent, and you really notice the lavender too, which makes it perfect for applying at night time when you want to relax and go to sleep. The product aims to restore skin overnight, helping it to recover radiance. It's a lovely oil to use as it's light-weight, easily absorbed, and works well on top of any other serums and night creams I've tried it with. I feel like it gives my skin an extra bit of nourishment, and my skin does look better in the morning. It doesn't deliver any ground-breaking results (not that it claims to), so I don't know if I'll rush to replace this when it runs out, as it does the same job as most facial oils. But, I do really love the scent and feel of this oil over others I've tried, and it has lasted well so far, so I'd probably pick up another bottle as a treat. It's £36 for a 30ml bottle. 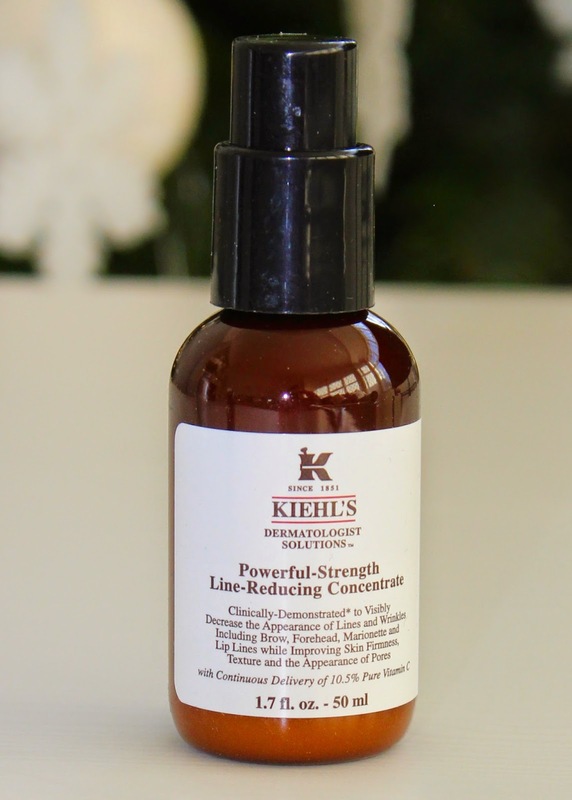 Alongside the midnight recovery concentrate I've been using the Kiehl's powerful-strength line-reducing concentrate. It's got a long name and a big claim, so I was pretty sceptical about what this little bottle could actually do. Its key ingredient is pure vitamin C (10.5%), which Kiehl's say has a proven ability to improve the appearance of ageing and it's recommended for lines on the brow and forehead, and around the eyes and mouth. I've been using the line-reducing concentrate for around a month - I started adding it to my night-time routine together with the facial oil, but once I realised it had some immediate benefits, I started using it for daytime too. I was surprised to find that this is incredibly effective! I didn't mean to doubt this in particular, but I don't think I've ever tried a product that's been able to do anything to attack my pesky forehead lines until now. It's not botox in a bottle, and the line have not completely disappeared, but this certainly makes them less prominent immediately, and seems to be reducing them as time's going on. On my forehead, at rest, I can only really see what I affectionately call the big daddy crevice - the smaller lines actually don't show now until I frown. This is a big deal! Around my eyes I can also notice a softening to the prominence of the lines there, and the same with the laughter lines. This product costs £49, so it's not cheap, and I use it sparingly just on the areas where I need it, which are forehead, and around the eyes and mouth. One pump covers that and I'm using it twice a day, so I estimate the 50ml bottle will last me 2 - 3 months. Will I replacing this when I run low? Without a doubt. Would love to try something like this, i have terrible forehead lines. Oooh that sounds interesting, I'll check that out - thank you! Glad to hear you love it too! I hate to buy anything without a recommendation these days! Should I apply Line Reducing before Midnight Recovery if I layer them?